We know everyone has lots of questions about the news this week that the Government has decided to scrap its plans to fund the NDIS through an increase to the Medicare Levy. We promised you we would try and find out more. So we have managed to score a short interview with the Minister for Social Services Dan Tehan. We asked the Minister the questions you have all asked this week – whether directly to us or through social media. We know you want answers. We do too. It’s good to hear both sides of politics commit once again to fully funding the NDIS. It’s great to hear everyone talk about how important the scheme is, not just to people with disability, but to the country as a whole. Everyone wants it to work. But what we need to see in the coming days and weeks is the detail – so we can absolutely be sure the NDIS will be around for many years to come. And then we can all stop talking about funding and get on with the really important job of making sure the NDIS works the way it should. We want it funded and we want it fixed. And fast. Sign the NDIS Fund it and Fix it petition here. 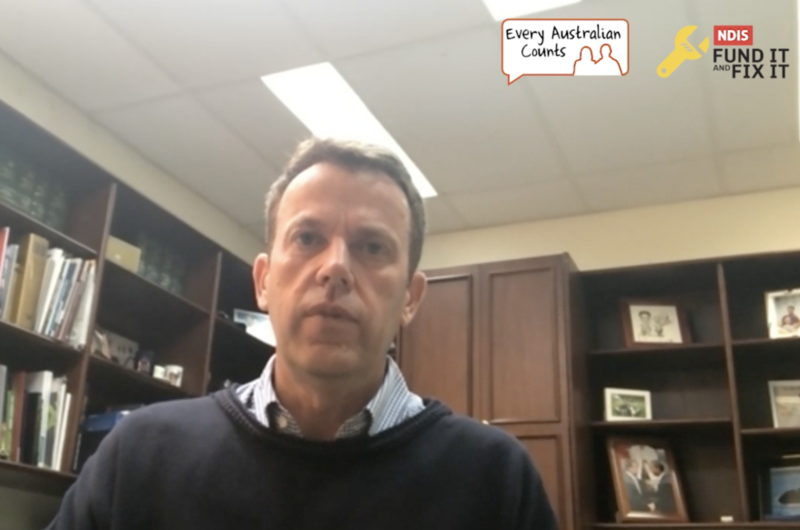 Watch our interview with the Minister for Social Services Dan Tehan. KIRSTEN DEANE: Alright, so thank you Minister for taking the time to talk to Every Australian Counts today. I’ll get straight to the questions that all of our supporters really want to know, which is – what’s changed? Why have you decided to scrap the increase to the Medicare Levy? MINISTER DAN TEHAN: What’s changed is that we wanted to provide certainty going forward for all those people with a disability. Obviously, the measure that we introduced in last year’s budget wasn’t getting the support from the Parliament that it needed, so we’ve decided to take the politics out of this issue when it comes to funding. We have now, due to our strong economic management, the ability to fully fund the NDIS from the budget, so that’s what we’re going to do. And now, the focus rightly can be on implementing the NDIS. KIRSTEN DEANE: So, one of the biggest concerns that people with a disability and their families have about scrapping the Medicare Levy is that while the budget may look good this year, it may leave the NDIS unfunded in future years. Our supporters really want to know what’s the plan – how can we really be sure that the NDIS is going to be fully funded in the future? MINISTER DAN TEHAN: Because the budget will show that it will be fully funded and that will be very clear. You have a commitment from the Prime Minister, from the Treasurer, from myself – that it will be fully funded. And also, the Labor party have said they will fully fund the NDIS. So just like we fund defence, just like we fund Medicare, we are funding the NDIS. It will come out of consolidated revenue. But the money is there, it will be there, it will be fully funded. End of story. Period. KIRSTEN DEANE: So lots of people with disability and their families have told us that they’re worried that they’ll be left in limbo, and that we will have to fight for funding year after year after year. So what do you want to say to them? What’s your response to them? MINISTER DAN TEHAN: You won’t have to do that. The funding is committed, it is there in the budget, it will be there in the budget. What I want everyone to focus on now is the implementation of the NDIS. This is the biggest social reform that this country has carried out since the introduction of Medicare. We need to focus on getting it right. It is a huge undertaking. And we need everyone focused on that element of it now. So in my view, this is great news. We’ve taken the politics out of funding, we now all can focus on rolling the scheme out. And we all know that that’s going to be a big undertaking, we’ve got to get it right, but we’re going to need all the help and support that we can to make sure we fully implement in a way that the NDIS lives up to it’s ideals. KIRSTEN DEANE: So we’ve heard your commitment to fully funding the scheme, and we’ve heard from the Treasurer, but obviously people are worried – sometimes the devil is in the detail. When are we going to hear more about what the detailed plan is to fund it in the future? MINISTER DAN TEHAN: That will be all laid out in the budget. It will become very clear that on the budget forecast that the money is there to fund the NDIS. That will be backed by guarantees from the Prime Minister, from the Treasurer, from myself, saying – it’s fully funded – let’s not worry about that element of it now – let’s get the implementation right. KIRSTEN DEANE: Minister, we were all taken a little bit by surprise by the events of this week. It seems a little bit unusual that we learned about this big change through the media. Is there a way that we can work together to improve communication between the government and people with disability – particularly about something that’s as big as the NDIS? MINISTER DAN TEHAN: Absolutely we’ve got to make sure we keep the communication channels up – open. When it comes to a decision like this which was a budgetary decision, it is the nature in the lead up to budgets that often these announcements are made and that the consultation has to occur while they are being made. Now my commitment to everyone in the sector as Minister is, and I was on the phone all day yesterday explaining to people why we’ve taken this position, is that my door is open. I will always be consultative. I will always want to talk to you and as we go along and fully implement the NDIS I very much want to work hand in hand with the sector in how we go about doing that. KIRSTEN DEANE: That’s great. I think our supporters will be really pleased to hear that you want to shift the focus to making sure that the NDIS really delivers for people with a disability. One of the things that people have found frustrating about all the talk about funding is that people with disabilities and families are having lots of issues with the NDIS at the moment. They want to hear more about how those issues are going to be resolved. What’s your plan? What do you have in mind to get the NDIS back on track? MINISTER DAN TEHAN: So, what we’re seeing is that the rollout, on the whole, is going very well. But there are some issues, especially when there is an interface between State provision of services and Commonwealth provision of services via the NDIS. What we have to do from both a Federal Government level and a State and Territory Government level is sit down and work through these complex issues. Now I’ve already been able to do that with my New South Wales counterpart. There are some cases I’m working on in Victoria at the moment with my Victorian counterpart. But what we need is a commitment from all levels of Government to make sure we don’t get into a blame game – but that we sit down and work through issues. And that is the approach that I’ve taken since becoming Minister. I must say in all the interactions I’ve had with the State and Territory Ministers – that’s the course of action that they want to take. So what we need to do though, is we’re going to have to have a little bit of patience as the scheme rolls out in dealing with these issues, because they vary from State Government to State government to Territory Government, and therefore, we are going to have to work through them. But as long as we all have the approach that we need to do this in a consultative way, we need to do it as quickly as possible, but at the same time, we’re keeping true to the fundamentals of the scheme, I think we’ll get the outcome we can. Still, over ninety percent of people are saying that their participation in the scheme has been a positive one for them. And also, we’ve brought 40,000 people into the scheme who weren’t getting services now are. So we have made really good progress, but a lot of hard work to go. There’s going to be a lot more issues that we’re going to have to work through. We’ve got the right approach and the right spirit to do that, I think we can roll out this game-changing scheme in a very efficient and effective way. KIRSTEN DEANE: So that sounds like the plan for some of the issues for the way that the NDIS interacts with other systems, but people with disability and families have told us through our survey there’s lots of issues to do with planning, and delays, and things like that. What would be the approach on those issues? MINISTER DAN TEHAN: So on planning we’ve made a very important change, the planning was occurring via phone. There is now a face-to-face element to that which I think is absolutely essential. So someone sits down, with the client, goes through their needs, goes through their expectations, their hopes – and does it on a person to person basis. So I think that is an incredibly important change. In that issue we’ve already made a change. Obviously we’re ramping up staffing in the NDIA. So we’ll see more staff coming on board next financial year, as of July 1. We’re continuing to ramp that element up of it. And we’re continuing to engage and continuing to listen. As we’re getting feedback during the rollout, we can then adapt, and make sure we are taking into account these concerns that have been raised. KIRSTEN DEANE: Great. So one last question Minister. What’s the one thing that you would like Every Australian Counts supporters to take away from this conversation today? MINISTER DAN TEHAN: That we are 100 percent focussed and committed to rolling out the NDIS. That we’ve got the funding political football back in the cupboard where it should be. So we don’t have to worry about that anymore. It’s just full steam ahead on implementation. In making sure that we have a world’s best scheme – a world first scheme – which provides the services that people living with a disability need. If we can achieve that in the coming years I think we will have done not only this nation a great service – not only other countries that are watching and seeing what goes on here to see whether they’ll put in place a similar approach – but absolutely most importantly and the number one priority we will have done a great thing for all those people living with disability here in Australia. KIRSTEN DEANE: That’s great. Thank you very much Minister for your time today, we know you’re very busy and we really appreciate it. Thank you. MINISTER DAN TEHAN: Any time. And this is a great way to be able to communicate directly with the sector so I thank you for the opportunity you have given me to be able to do this on what is a incredibly important issue.